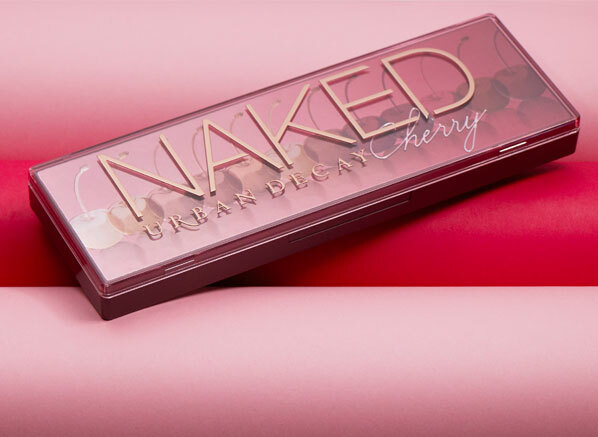 We’ve rolled out a crimson red carpet in celebration of a very exciting new launch: the Urban Decay Naked Cherry Eyeshadow Palette. With its 12 autumn-inspired eyeshadows, there’s no wonder that the Naked Cherry Palette is causing beauty hysteria. But then again, when has a Naked Palette not broken the internet! If this is the first time you’re hearing about the Cherry Palette, where have you been? 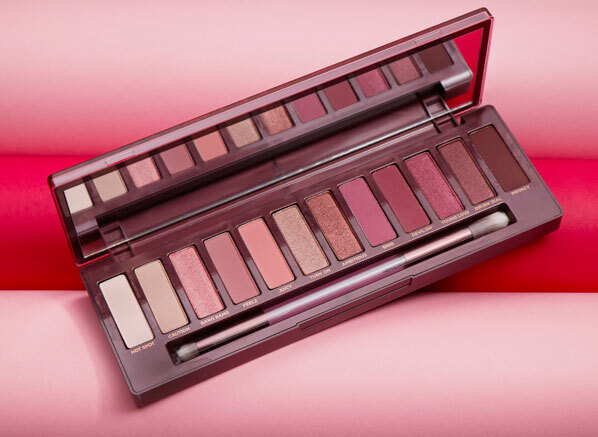 Many beauty lovers have been eagerly anticipating a new Naked Palette since the release of the sun-drenched Heat Palette in July and now one is here and even better than I could have ever imagined! If Urban Decay’s Naked Palette collection is news to you, know that you’re in for a treat. This franchise is iconic without a shadow of a doubt and has a total of 5 palettes under its belt. What started as an aim to create the perfect everyday eyeshadow palette back in 2010 has fast become one of the makeup industries go-to eyeshadow ranges. And it’s showing no signs of slowing down, especially if the Cherry Palette is anything to go by! The Cherry Palette has come at the perfect time too. 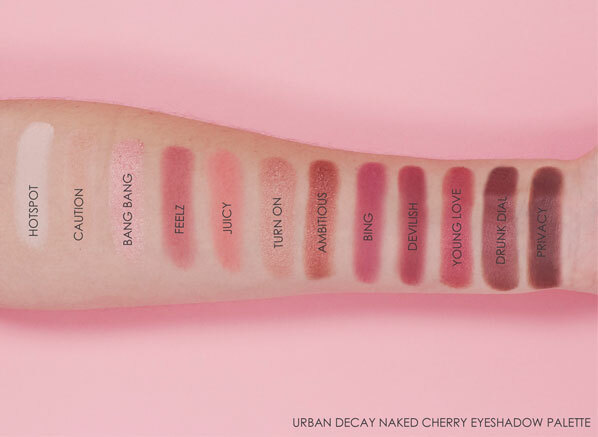 Not only are we still drying our tears after Urban Decay revealed the discontinuation of the original Naked Palette back in August (still available until sell-out), but the cherry hues of this palette could not be more fitting for the season. Inside you’ll find 7 mattes and 5 shimmers, which can be worn individually or layered to create a huge variety of looks (see some of our looks below). Great for every day and every occasion you could think of, Cherry is the next step for someone that loves neutrals but wants a pop of seasonal colour. The texture of the eyeshadows are smooth and buttery and the pigment is what you could only expect from a Naked Palette: exceptional. Plus, drop-out on the shimmery shades is limited, which means less touching up – hallelujah! And if you’re all about getting the most impact as possible, wet the included dual-ended brush (it has a side for packing on pigment and a side for blending) with a little Urban Decay All Nighter Spray. Not only will this enhance pigment intensity but it’ll improve longevity too. Trust me, I’ve seen a demo of this setting spray in action and it’s like magic! Hotspot is an ivory matte that’s great for highlighting. Caution is a soft neutral beige matte that makes a great base shade. Bang Bang is a shimmering pink with gold shift and iridescent micro-sparkle. Feelz is a soft dusty rose matte that works as a great transition colour. Juicy is a soft peach matte. It pairs beautifully with a red lip! Turn On is a pale metallic rose shimmer that’s perfect for everyday wear. Ambitious is a metallic rose copper with a golden shift. Bing is a deep cool-toned mauve matte that’s perfect for autumn. Devilish is a reddish plum with a strong berry hue. 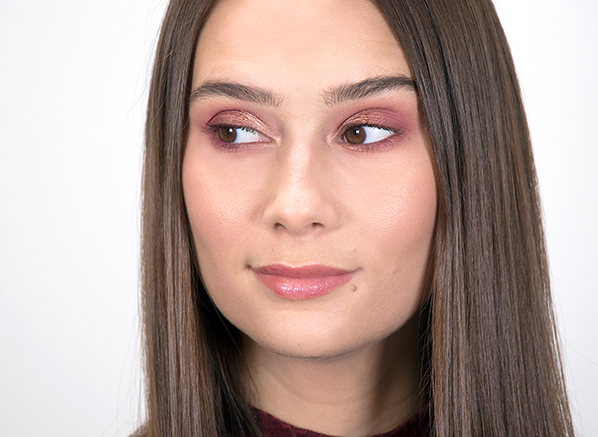 Young Love is a metallic cranberry – and the shade that inspired this entire palette! Drunk Dial is a deep metallic burgundy that’ll intensify any look. Privacy is a deep brownish-plum matte with a chocolatey tone. Yes, the Cherry Palette is packed full of deep, rich hues, but that doesn’t make it any less wearable. 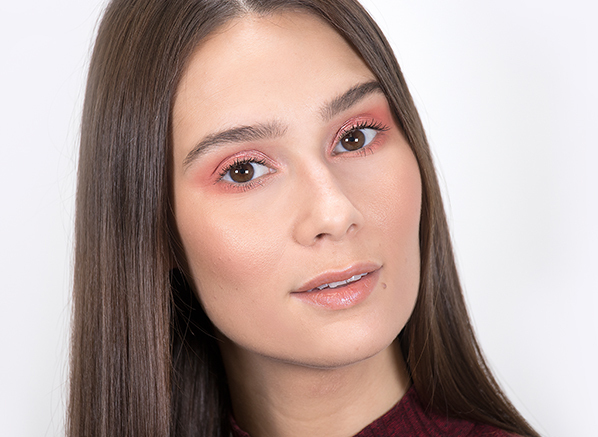 We created this enchanting peachy-pink look using just 2 colours! Start off by prepping the eyes with the Urban Decay Eyeshadow Primer Potion, then place the shade ‘Juicy’ on the outer corner of the eye and the outer lashline. Next, spritz your brush with Urban Decay All Nighter Spray and place ‘Bang Bang’ on the inner corner of the eye and all over the lid, all the way up to the brow bone. Some days you want to up the ante, but you also don’t want to overdo it. For days where you want to look and feel your best, this is a great go-to look. Kick things off with the Urban Decay Eyeshadow Primer Potion, then blend ‘Feelz’ throughout the crease as your transition colour and blend upward toward the brow bone. Next, use ‘Bing’ to add intensity to the outer corner. Then, over ‘Bing’, apply ‘Devilish’ and blend out thoroughly, this step will help create even more intensity in the outer ‘v’ of your eye. After that go in with the ‘Drunk Dial’ on an angled brush to create a soft, smoky eyeliner effect on both the top and bottom lash line. To up the pigment spritz your brush with the Urban Decay All-Nighter Spray – it’s like magic! Now, take ‘Turn On’ and apply only to the inner section of the eye, top and bottom. In the centre of the eyelid, apply the coppery shade, ‘Ambitious’. As a finishing touch run the Urban Decay 24/7 Glide On Eyeliner in Black Velvet over your waterline. If you want to make the most of your Cherry Palette this show-stopping spotlight eye is the look to recreate. Begin by prepping the eyelids with the Urban Decay Eyeshadow Primer Potion Anti-Ageing, then apply the shade ‘Juicy’ throughout the eye socket and underneath the eye as your transition colour. Next, use the shade ‘Bing’ to add definition to the crease, but remember to leave the centre of the eye completely free of this shade (this is the gap for the spotlight eye). Now, it’s all about upping the intensity. Apply the shade ‘Devilish’ to the outer ‘V’ of the eye and blend, then place ‘Privacy’ over the top of this and blend once again. Complete this step by applying ‘Privacy’ to darken the inner corner of the eye too. For even more definition, apply the Urban Decay 24/7 Glide-On Eye Pencil in Black Velvet to the inner corner and outer corner and blend to smoke out. To create the spotlight, apply concealer with a brush to the centre of the lid. Use the shades ‘Juicy’ and ‘Bing’ to blend the concealer into the eyeshadow on either side, which will soften the edges and help the colours merge together. Apply ‘Turn On’ over the remaining section of concealer and blend the edges with ‘Young Love’. Apply ‘Privacy’ as close as possible to the lower lash line for extra depth. Then, wet your brush with Urban Decay All-Nighter Spray and apply ‘Turn On’ only to the centre of the lower lash line, use ‘Young Love’ to add more drama if needed. To complete the look, use the Urban Decay 24/7 Glide-On Eye Pencil in Black Velvet on the lower and upper waterline and apply the Urban Decay Heavy Metal Glitter Eyeliner in Grind to the centre of the eyelid. Top tip: when applying the glitter, remember to keep looking down while it dries to minimise transfer. This entry was posted on Monday, November 5th, 2018 at 10:27 am and is filed under Hints & Tips, Make-up, New products, Swatches. You can follow any responses to this entry through the RSS 2.0 feed. You can skip to the end and leave a response. Pinging is currently not allowed.